Having already littered classrooms with countless Chromebooks, Dell is turning its Chrome OS efforts to the living room with a new set of laptops with the Inspiron moniker. Announced at IFA 2018, these Chromebooks come in one straight 11-inch and one 2-in-1 11-inch varieties, as well as a particularly interesting 14-inch 2-in-1 model. Starting with star of Dell’s Chromebook show, the Inspiron Chromebook 14 2-in-1 is a premium-built laptop with an aluminum shell and Full HD (1,920 x 1,080) touchscreen. The tablet comes with an electromagnetic response, or EMR, stylus that tucks into the aluminum base. Inside, the laptop houses an Intel Core i3 processor that drives 4GB of DDR4 memory and a 128GB eMMC SSD. That all comes together for $599 (about £464, AU$814) when this laptop launches on October 23 in the US. 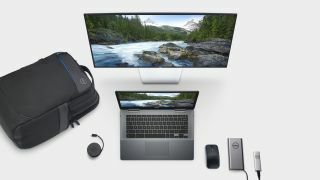 Dell has also released two 11-inch Inspiron Chromebooks, one that’s a straight laptop and another that’s a 2-in-1 laptop, both running on the same Intel Celeron processor that’s found in most Chromebooks of their size. Both laptops house a 1,366 x 768 display, with the 2-in-1 variety being a touchscreen that can bend 360 degrees. Both versions of the laptop come in plastic shells, with the straight laptop offering 16GB to 32GB of eMMC storage with 4GB of DDR3 memory and the 2-in-1 putting up 32GB to 64GB of storage and the same memory. Likewise, both laptops have two USB 3.1 ports as well as HDMI and a microSD card reader. Unfortunately, Dell hasn’t yet disclosed pricing or release information for these Chromebooks. We’ll update this story once we receive this information. In the meantime, read our hands-on review of the Dell Inspiron Chromebook 14 2-in-1.